According to sales stats, in 2017 the USA enjoyed its third straight year with total vehicle sales above 17 million units. Whoopee! The car industry is holding its own, and then some! Whoa! Hold the phone! A quick look behind the total sales numbers reveals a pretty grim picture for the US auto industry. 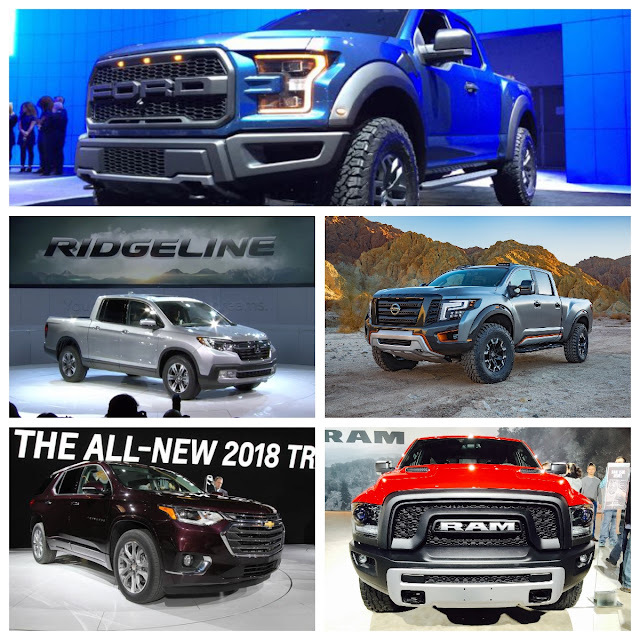 This week the Detroit Auto Show opened its doors to the media, and the big news is? You guessed it, TRUCKS! Gasoline prices have dropped, so Americans have once again embraced SUVs and trucks, leaving cars behind in the exhaust fumes. Also, despite the big sales numbers, regular buyers are dropping off like flies. Buyers of new vehicles have dropped for two years in a row. Four things are driving this – first, increasing interest rates are driving up hire purchase and leasing costs; Second, younger drivers are showing less interest in OWNING a car, preferring daily rentals; and third, older car owners are keeping their cars longer; and fourth the number of low mileage, ex-lease cars coming onto the market has jumped from 3.6 million cars in 2016, to 4 million last year. The only thing driving new car sales up are units sold to fleets and rental car companies. Some things never change! This means that whilst automakers bump up production numbers on trucks and SUVs; those same manufacturers are looking at idling passenger car plants, laying off workers, and we may even see some nameplates disappearing. The other significant issue affecting carmaker profitability is the ever-increasing cost of ‘marketing’ (ie: cash incentives). Autodata Corp. says average incentive spending heading into June 2017 was up 15 percent to $3,516 per vehicle sold. Despite weakening demand for cars, incentive spending for light-duty trucks increased 16 percent compared to 13 percent for light-duty passenger cars during the first five months of the year. Now, incentive spend, on average per vehicle, is close USD$4000 per car – a position many analysts say is unsustainable, especially in light of the fact that so far this year (adjusted against 2017's annual rate of 17 million) overall sales are down 2%. Alix Partners of Detroit is forecasting lower overall sales of new vehicles in 2018, and maybe even lower sales again in 2019. It says the market is plateauing. Example: cars like Camry, used to make up 25% of sales – they now account for just 15%. As President Trump only has a sufficient attention span to read headlines, and not the body copy, he will undoubtedly dwell on the headline sales numbers and pronounce the US car industry is in rude health. Maybe one of his acolytes will try to explain the real truth, but in typical Trump fashion, he will ignore that, and dismiss the reality as ‘fake news’. And, you can forget about all this self-driving cars stuff amounting to anything worthwhile inside the next ten years. In the USA, it simply will not happen. There are really big changes coming in the car business over the next 10-15 years, most of it structural – in the way cars are made and sold. 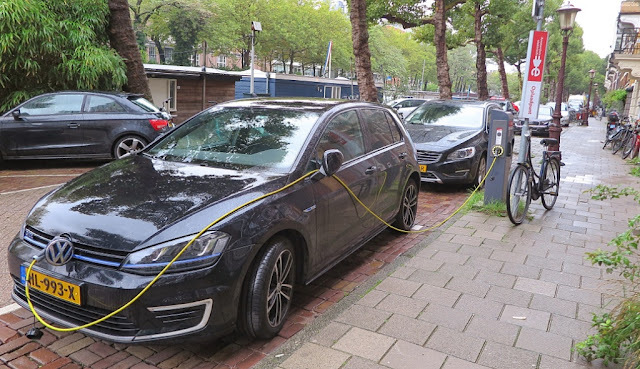 Any decent growth in electrically-powered cars will change the build costs, as designers no longer have to accommodate conventional powertrains, so the whole cost structure will change, and surprisingly may lead to tighter profit margins as this transition occurs. That is because all the new electronics needed for new vehicle designs are going to bump up manufacturing costs. EVs may be simpler, but they won’t be cheaper to make. Only one company says it will buck the trend of loss-making EVs – and surprisingly, that’s General Motors. It’s already showing encouraging sales for the Chevy Volt (below). GM’s Chairman and CEO Mary Barra says GM has a recipe for making profitable electric cars, and observers say GM’s planned new EVs will swamp Tesla, which has never made any sort of profit, and which some analysts say may well disappear in a cloud of SpaceX smoke! Now, whilst I am banging on about a bright future for GM’s electric vehicles, spare a thought for Tesla. Just in case you are one of the people who harbor the view that Tesla is successful and profitable, and about to smash its rivals, here’s some sobering stats. 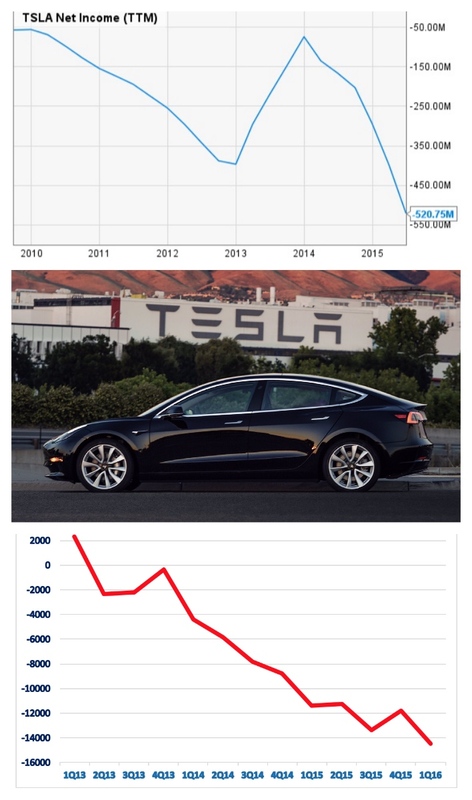 The top graph shows Tesla’s Net income stream (2010-2015), yes, it lost USD$520 million so far; the photo is the Tesla 3, the car Elon Musk says is Tesla’s big volume seller (only 800 cars delivered so far); and the bottom graph shows Tesla’s profit per car between 2013 First Quarter and 2016 First Quarter. Mark my words – Tesla will be automotive road kill within five years at this rate! I’m glad I’m retired and just watching from the sidelines.